In 1994, Nintendo ported its decade old arcade classic, Super Punch-Out! to the Super Nintendo. The game featured familiar and colorful characters from the NES prequel and drew gamers into a pseudo-RPG boxing world setting. It received great reviews and is still remembered by many as a 16-bit favorite. One year later, Sega, with the help of the then-young EA Sports, released its answer to Super Punch-Out! 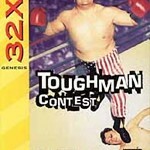 on the Genesis: Toughman Contest. The Genesis version, though, wasn’t much of a success. To attest to its failure, it’s almost impossible to find today. Sega’s re-release on the 32X followed a similar path commercially, but it delivered a unique experience its Genesis and Super Nintendo predecessors could not. 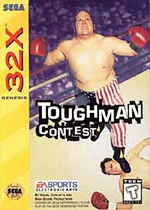 What does Toughman Contest 32X have that the other games do not? An environment so badass that after stepping away from your Sega, you will inadvertently super upper-cut your kids and/or wives. All the features of the game, although certainly not state of the art (and especially not for 32-bit), help get you psyched about letting opponent Hans Fischer know what you think about that whole World War II ordeal. The graphics aren’t anything mind-blowing. The player’s wire-frame figure doesn’t exactly push the capabilities of the 32X and little moves on screen aside from the players. Even the status bar at the bottom of the screen looks like something out of a last gen game. More importantly, though, the graphics don’t detract from the environment. The fact that the background is semi-static may actually be a good thing simply because it doesn’t distract you from the two large figures beating each-other in the center of the screen. Toughman resists the temptation to use cartoonish graphics, such as those in Super Punch-Out!, and the result is definitely positive: instead of being distracted by goofy sprites, the player can take this game seriously and really get into it. Considering that Toughman is plagued by the same sound problems as all other Sega Genesis & 32X games, it’s amazing that the game actually manages to make use of the sound. The music is repetitive and simple, but the rapid drum beat keeps you on the edge of your seat and in the game. Most of the other sound effects are no worse than the usual for this game’s peers. Even though Toughman was never recognized as innovative or even enjoyable by most, it does provide some great and challenging game play if you’re willing to give it a chance. With more than twelve basic attacks, Toughman might seem like it has complex controls at first, but after an amazingly short period, you grasp the remarkably responsive controls and learn how to put together the combos that are necessary for success. More devoted players can eventually learn how to effectively use their special moves, which you can choose at the beginning of every round. What’s really great about Toughman is that it lets you develop a style; you have fourteen characters to choose from, all whom have specific ‘power,’ ‘speed,’ ‘stamina,’ and ‘recovery’ attributes, each of which drastically affects game play. The corner man always provides useful strategic advice in between rounds and lets the player know how they’re doing and what they need to do to win the fight. The opportunities for KOs and TKOs means that the player is never done-for and can almost always, with a stellar performance, make a comeback. Additionally, the password save system, though tedious, is a nice feature that ensures that the player won’t be fighting the first few opponents time after time. One feature that would have made Toughman a much better game would be a multi-player option. The lack of one, however, does not mean that it is strictly a single-player game. In fact, this game can provide entertainment for any number of players. The separate bouts, rounds, and continuous knock-downs provide multitudes of opportunities for players to take turns in the ring. But don’t worry when your turn to sit-out comes; Toughman is almost as fun to watch as it is to play, and nothing can beat the charge in a room full of friends cheering each-other on. The feeling inside an arcade is perfectly replicated when a player performs an excellent combination only to be elbowed in the face and knocked to the floor: friends begin shouting angrily at the screen and a near-riot breaks out. The replay feature, which allows players to watch themselves rock or get rocked time after time is not only another opportunity to brush up on your strategy but is also a great crowd-pleaser. Toughman may not be any sort of gaming masterpiece, and it’s definitely not for everyone, but if you dig the style and have a few friends willing to attempt to beat the Toughman contest, it is definitely worth the interest. ← Sega's SVP Chip: The Road Not Taken?